City Council Member Rory Lancman wants to make it more difficult for NYPD to charge drivers who injure and kill people when, in his words, “accidents are caused by poor road conditions, bad weather and scofflaw pedestrians.” But if anything, NYPD has been exceedingly cautious in applying the Right of Way Law when there’s a chance the victim was not in a crosswalk. If there’s even a speck of doubt about whether the victim had the right of way, NYPD isn’t filing charges against the driver. 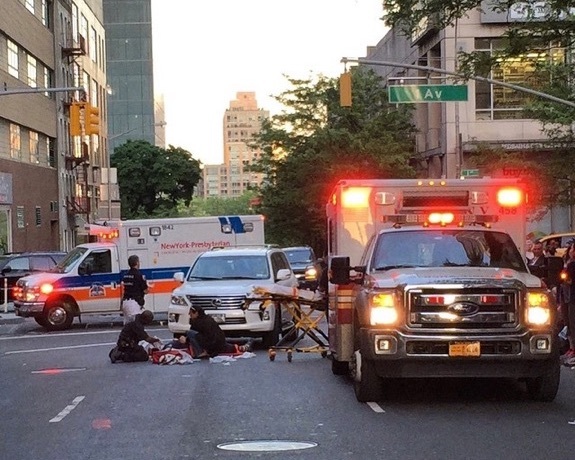 The above photo was taken by a reader after an SUV driver fatally struck 89-year-old John Torson as he was walking across E. 61st Street at First Avenue. As we reported last Friday, the day after the crash, an NYPD spokesperson told Streetsblog that, according to the Collision Investigation Squad, Torson was “outside of the marked crosswalk” when he was hit. You can see from the photo that, if Torson was not in the crosswalk, he was at most no more than one car length away. You can’t rule out the possibility that Torson was struck in the crosswalk and propelled forward by the force of impact. As of today, police had filed no charges against the driver. The Right of Way Law took effect last August. Between last September and March 2015, the latest month for which NYPD crash data is available, city motorists injured or killed over 8,000 pedestrians and cyclists. As of April, NYPD had applied the Right of Way Law just 22 times. NYPD is training beat cops to use the law, but as of now virtually all cases resulting in Right of Way Law charges are investigated by the Collision Investigation Squad — a small unit of detectives who are trained to process crash scenes, and whose work is relied upon to convict motorists on serious charges, like homicide. With an application rate of one-quarter of one percent, and investigators declining to prosecute drivers whose victims were said to be just outside the crosswalk, it’s clear that NYPD is being very conservative with the Right of Way Law. Lancman’s proposed Right of Way Law amendment — which would absolve drivers who harm people when the weather is bad — would lead police to apply the law even less frequently. Thanks to the voters who elect people like Rory Lancman, and then re-elect and re-elect them again. Good job. Keep New York awful. So if a pedestrian puts a foot out of the crosswalk they’re a scofflaw and their very life is forfeit, but people are still getting away with hitting pedestrians on the sidewalk? Lancman is more dangerous than the hammer man. a call for political reform! Oh, it’s worse than that. The pedestrian is deemed outside the crosswalk if his body is dragged or bounced outside the crosswalk. The only way a pedestrian can remain in the crosswalk, when struck by a car, would be for his body (typically weighing less than 200 pounds) to resist the oncoming force of the car (typically weighing multiple tons). The laws of physics make this impossible. Worth repeating: in 8 months (Sept. 2014 – March 2015) drivers killed or injured 8,000 vulnerable road users – pedestrians and bicyclists. In only one quarter of 1% of the cases, so only 0.25% of the time, is the Right of Way law being applied. It is only being applied right now in cases that are investigated by the Collision Investigation Squad, which only investigates collisions where the pedestrian/cyclist was killed or was severely injured and is likely to die. This means the few drivers being charged have ended someone’s life or have severely injured someone to the extreme that that person will likely die from his/her injuries. Facing a misdemeanor charge is very mild compared to what they have inflicted on someone’s family and on society due to their driving. Everyone cross the street “upstream” from the crosswalk so if you get hit your body lands in the crosswalk. I do that. I actually legitimately do that and the picture above is exactly the reason. Unlike Lancman and the NYPD, I actually understand physics, and when a multi-ton machine meets a human, that human is going in the direction of the machine, no matter what. So if crossing in the crosswalk and ending up just outside it after being hit by a car makes me a “scofflaw” then I guess I’m forced to cross outside it just to be considered a law-abiding citizen. I joined in a conversation with Rory Lancman today on Twitter about this. He says he hasn’t said cops are arresting people who’ve hit jaywalking pedestrians. He says he’s just floating that as a point of concern and the big problem is I’m a nasty, distorting liar for suggesting he’s making out that drivers are getting arrested for hitting jaywalking pedestrians. I asked him how long he thought it was legitimate for New York’s annual road death toll to be twice that of slightly more populous London. He didn’t have a straightforward answer on that. It was all rather extraordinary. Lancman knows that exempting TWU drivers, which he supports thanks to campaign donations I suppose, is never going to fly. There’s no rational explanation for why one type of driver should be excused over another. So the only other option is to tie NYPD’s hands so tightly that almost no driver can be charged anywhere. Seems pretty simple and craven. Four wheels good, two legs bad! But the act of doing that would probably greatly damage the sweet grill job on the vehicle, making it also a property crime. Also, don’t even go outside in the event of drizzle, light snow, slight wind, sunlight, night, dusk, dawn, overcast, or ever. All of these things prevent smooth operation of a vehicle, thus, any actions that occur are not the fault of the driver. It’s even worse than that. Rory wants the police to consider “road design,” which seems to mean that, if the DOT has created a driver-pedestrian/cyclist conflict that puts the pedestrian or cyclist in unreasonable danger, then the driver is off the hook, as long as they’re behaving in the way designed. So, imagine: a fast veer through a left turn across a crosswalk where the pedestrians have the ROW. Or a cyclist crushed in one of those “mixing zones” that punctuate a protected bikeway. Or a sharrow! The cyclist was controlling the lane, and I tried to pass! How was I supposed to know that would be dangerous, when the sharrow’s on the far left/right of the lane? The bottom line of all this is that the people who have to take extraordinary care are pedestrians and cyclists – those who have the least control over driver behavior, and are most vulnerable to driver carelessness. I have no idea whether a driver’s going to try to squeeze through a stale green light, whether they’re prepared to stop in the rain, or whether they can see me. But if I don’t guess correctly, I’m dead, and the driver’s off the hook. It’s more John Bunyan than George Orwell. Four wheels of Goodwill, two legs of Baal Zevuv. This is insane. AFAIK, the way crosswalks are striped seem pretty arbitrary. A few feet narrower, a few feet wider. Thin stripes. Zebra stripes. Do a walking person’s rights to walk and to live truly end where the paint stops, or does the law apply a “reasonable person” approach: If a person is crossing in the vicinity of the crosswalk, s/he has ROW? The collision occurred at an intersection where DOT allows people to park their cars to the edge of crosswalks, which hinders visibility and safety.